Great Toyota RAV4 car Leasing & Contract Hire Deals. Our Toyota RAV4 Lease Deals. Though opinion may be divided as to whether the RAV4 invented the soft roading segment, few people doubt that, more than any other, this model defined it. In some ways, it continues to do just that, for this car still sums up a lot of what a vehicle of this kind should be all about. Smart, reasonably spacious, affordable to run and with just enough SUV-ness about it to get you to the places you tend to dream about but will probably never go. The changes Toyota has made in further refining this fourth generation model have been welcome. The car now has more equipment and the hybrid engine most buyers want is more widely available across the range. Perhaps then, this is, as Toyota assures us, 'a better way' of owning a model of this kind - you decide. One thing's for certain: for many, this car's buying proposition still makes family-friendly, real world sense. It's easy to underestimate quite what a debt of gratitude we owe the Toyota RAV4. Back in 1994, the market for compact 4x4s was massively different to the one we have today. If you wanted a modestly-sized SUV back then, you had to get yourself one remembering that it was likely to fall over if it was shown a picture of a corner. The RAV4 changed all that. It was the first small 4x4 that was actually good fun to drive on road. But times change. The RAV4 has grown ever bigger and more sophisticated in response to rival soft-roading compact SUVs like its nemesis, the Honda CR-V. The fourth generation car, first shown in late 2012, is a smarter take on a well-established theme and was further developed late in 2015 with a smarter look and feel, plus the option of hybrid power. It's since been further embellished with a range of attractive trim packages. If you haven't looked at a RAV4 for some time, the key thing you'll need to update yourself on is the changes that have taken place under the bonnet. Here, the important news is the availability of a hybrid model. Toyota has chosen not to offer the kind of Plug-in hybrid technology here you get in a rival Mitsubishi Outlander but the more conventional 2.5-litre VVTi petrol/electric unit you do get is commendably smooth and frugal, putting out 194bhp and able to get to 62mph in 8.4s. It's offered with either two or four-wheel drive configurations, the latter equipped with Toyota's E-Four system. This uses a second electric motor at the rear which provides automatic electronic all-wheel drive to give increased traction. 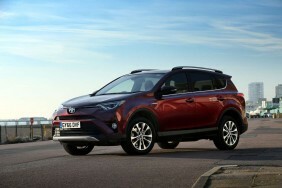 The lightweight technology - there is no central propshaft - also gives RAV4 Hybrid a 1,650kg towing capacity. 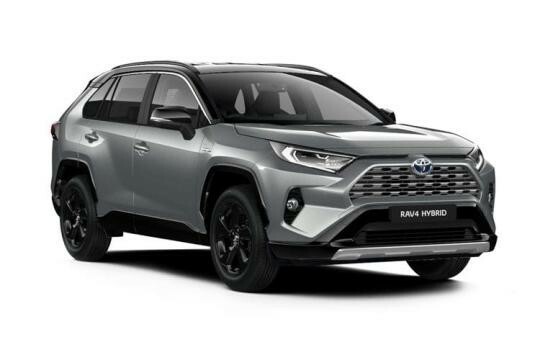 Of course, many RAV4 buyers will prefer to save a little up-front cost and stick with a more conventional powerplant up-front - probably a diesel. For these folk, Toyota offers a 2.0-litre D-4D diesel unit with 141bhp. Here, you get a decent 320Nm slug of torque and 62mph is 9.6s away en route to 121mph. Unfortunately though, you can't have automatic transmission or AWD with this powerplant. Both these things though, are included on the 2.0-litre Valvematic petrol variant which offers 149bhp and makes 62mph in 9.9s en route to 115mph. This heavily revised fourth generation RAV4 got a smarter look back in 2016 - and in particular, a sharper front end. That did a lot for its appearance, the slender upper grille these days flanked by halogen or LED headlamps with integrated LED daytime running lights. Inside, the cabin still doesn't have a truly premium brand feel, but it does now look decently inviting. The instrument binnacle, the centre console and the gearshift surround all have a nicer feel than earlier models could provide. Plus the centre console has been neatly designed to accommodate the intuitive Toyota Touch 2 infotainment system touchscreen. Otherwise, things are much as they were in the original version of this MK4 model. All the instrument and switchgear is backlit in cool blue and the dash features strong upper and lower beams, interrupted by a curved, metal-finished spar to frame the instrument binnacle, steering wheel and driver's footwell. The front-to-rear seat couple distance remains a best-in-class 970mm. Combined with a thinner front seatback design, this increases rear legroom. Thanks to Toyota's Easy Flat system, the rear seats can be quickly and easily folded flat (the seats dividing 60:40) and each section can be reclined independently. The load space is long, increasing capacity to 547-litres, and there's also a 100-litre undertray. Your perspective on RAV4 pricing will depend upon what kind of car you perceive this to be. The motoring mags will tell you that it competes with upper-spec versions of family Crossovers like Renault's Kadjar and Hyundai's Tucson - but against these cars, it looks quite expensive, with prices pitched in the £27,500 to £35,000 bracket. Toyota though, perceives this as something more than a Crossover: yes, the RAV4 can appeal to that kind of buyer but traditionally, it's also been something more sophisticated, a more capable compact SUV too - a car like Honda's CR-V. It's certainly priced very similarly to a CR-V. There are three engines on offer, with two-thirds of customers typically opting for the petrol/electric 2.5-litre hybrid, which is of the non-plug-in variety and comes either front-driven or 4-wheel-driven. The alternative options are a 2.0-litre D-4D diesel with manual transmission that (curiously) only comes in front-driven form. Or a 2.0-litre Valvematic petrol derivative that ony comes in AWD guise and only with a CVT auto gearbox. There are four trim grade - 'Icon', 'Icon Tech', 'Design' and 'Excel'. All models get the brand's Toyota Touch 2 infotainment system and providing you avoid entry-level 'Icon' trim, this set-up will come in 'Toyota Touch with Go' form which gives you navigation. All variants now feature the brand's 'Safety Sense' package of electronic camera-driven safety features - things like autonomous braking, lane departure warning, adaptive cruise control and automatic high beam. The 141bhp 2.0 D-4D diesel unit manages 60.1mpg on the combined cycle and 123g/km of CO2 on 17-inch wheels. It's interesting to compare these figures against those of the petrol/electric 2.5-litre Hybrid variant. This derivative manages 57.6mpg on 17-inch wheels and 115g/km of CO2 in 2WD form. Or 55.4mpg and 118g/km in AWD guise. Go for the conventional automatic 2.0-litre Valvematic petrol model and the figures are 43.5mpg and 152g/km. The RAV4 Hybrid falls into VED tax band C, so owners will pay nothing for the first year registration. Toyota talks of owners saving around 12% in BIK tax payments over an equivalent diesel model, a saving of £2,287 for a 20% UK tax payer. Plus of course you'll be using cheaper green pump fuel. As for residual values in the range overall, well these have always been good for RAV4 buyers, in most cases bearing comparison with the models from premium brands and there's little reason to doubt that they'll only improve this time round.